You have taken your product or sub-assembly from concept to model to prototype to pre-production. Now you are ready for production. Awesome – well done! Complete Bill of Materials (BOM) – including all special requirements such as additional UV protection, reflective webbing, specific break strength, etc. Complete, detailed drawing of your product OR a complete, production ready sample. If your sample or drawing is not complete we can help fine tune it. Contact us here. 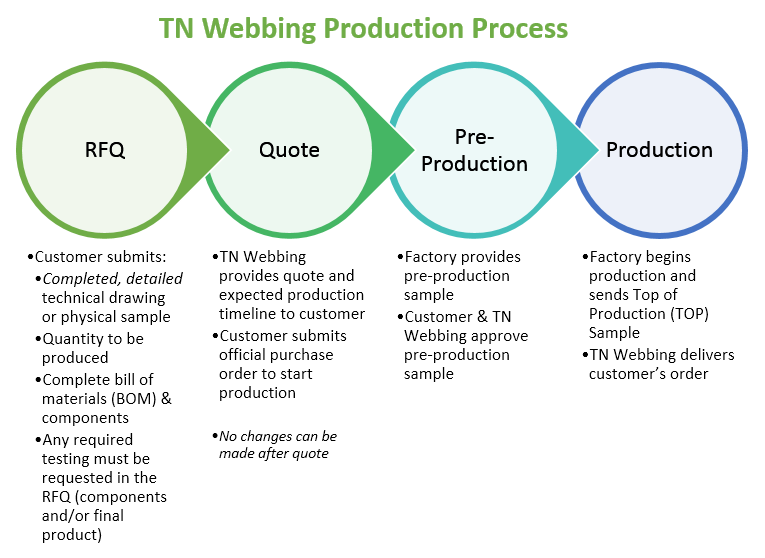 TN Webbing products will keep your product details confidential. If you require a Non-Disclosure Agreement please contact us here before you complete the form below. Need a product produced? We may be able to help. Please complete this Application and Production Ready Checklist for our production team to review. Be sure to check off which requirements you have met. This will determine whether you are production ready or need our pre-production and prototyping services. You must complete each question below. Our product design & development team will review your product to ensure that TN Webbing can assist you with your sewn goods product. Please describe in detail. If it is a sub-assembly please provide information on the final use in the final product. Technical drawings should be submitted with this form. You will receive direction on where to send your physical sample once your application has been reviewed. A COMPLETE list of materials needed to product your product. Please attach your BOM to this form. Please describe in detail. If there is no testing required please state that above. Be specific. Please provide any drawings or specifications on packaging.